The morning's alpenglow had us energized. I started up some moderate but runout rock, a signature of the Canadian Rockies, but by the end of my block of pitches the clouds had rolled in and rain droplets started their staccato on our jackets. As I finished my pitch, a Corb Lund and the Hurtin' Albertans track turned on in my head: "He's a Bucking Horse Rider and he likes 'em a little wilder than most...." The tune put me at ease as the rain's cadence picked up and I belayed my partners over. Within minutes, an electric fork struck the neighboring peak, Mt. Fifi (2621m), and only one Mississippi passed before the boom lashed the length of Forty Mile Creek below us. The first time I saw Mt. Louis (2682m) a deep malaise came over me. I was 19 years old then, fresh from the flatlands and although I didn't have the requisite skills, I knew I'd have to go up there and climb it someday. This limestone rocket ship held a siren-like quality that beckoned me to its dangerous, rocky flanks. Years later, here I was with two other Squamish climbers, Tony McLane and Jason Ammerlaan, putting up a 600-meter route on the beast. Mt. Louis, located in the Sawback Range of the Canadian Rockies in Banff National Park, is one of three striking peaks visible from the east on Trans-Canada Highway 1, with Mt. Fifi rising northwest of Louis, and Mt. Edith (2554m) lying southeast of the peak. The peaks are distinctive because of their origin: Louis, Fifi and Edith are typical of the Sawback Range, composed of layers of Devonian limestone that have been tipped on end, presenting stark, vertical faces. 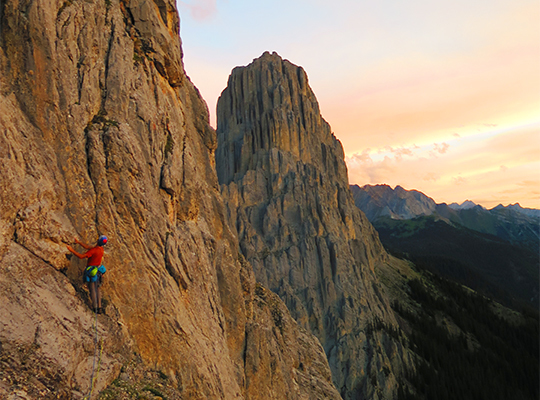 While Edith offers steep climbs and a scrambling route, sheer cliffs guard Mt. Fifi and Mt. Louis. As a young man I had learned the lore of this mountain that had first been ascended by visionary mountain guide Conrad Kain and his guest Albert MacCarthy in the summer of 1916. By the time I got around to climbing the Kain Route (5.7), Mt. Louis already felt more familiar but no less intimidating. In the following years I climbed a variety of lines and even endured an epic while attempting a new route. I hadn't thought much about Louis since moving to the west coast, but by chance this summer I was recruited for a Rockies mission by two young guns, McLane and Ammerlaan. When our first plan fell through, I tossed out the idea of a new line on the north side of Mt. Louis that I thought could link up with Homage to the Spider (5.10), a route opened by another legend of Canadian climbing, Tim Auger. Without much to go on, we borrowed some pins from a friend in Canmore and on July 19 we started toward the mountain "Squamish style," at noon. Our leisurely approach took us to the base of the northeast face just around suppertime and we scrambled up the approach slopes, roping up for a few exposed pitches. It was easy to excavate a bivy and we settled in for a show of stars. The next morning, after just a few pitches, we were halted by a crack of lightning, and the knowledge that maybe it would be best to wait things out for a bit. It's easy to appeal to a higher power when things are out of your control and for a second there on the lonely flanks of Mt. Louis, I bowed my head and handed over the reins. When Tony and Jason made it to the belay we pulled out the bivy tarp and hunkered down. Under the protection of the fly, morale was better and within an hour conditions improved. The beauty of limestone is that not only does it dry quickly because of its porousness, but its texture makes it climbable even when wet. Jason started up the next block—the sixth of our 10-pitch route—with his trademark positivity, and got us up a couple more pitches before we had to whip out the tarp again. The pulses of rain became weaker and we found ourselves below the crux pitch. The honor was Tony's since it was his birthday. Tony scrapped his way up the 5.11 enduro corner that ran for 35 meters but he succumbed to the pump just before reaching the top. 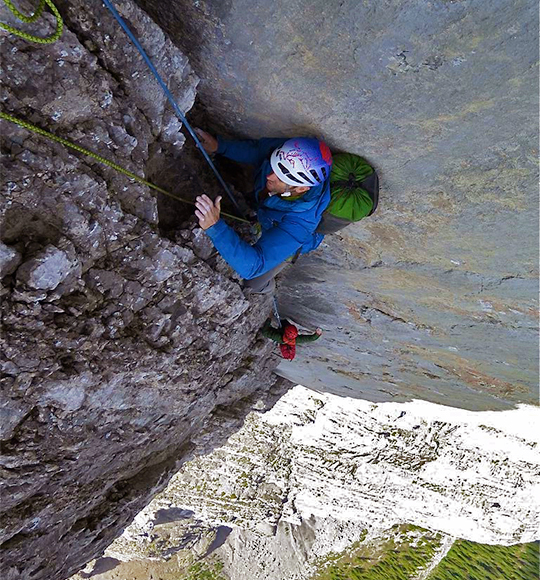 We all wanted a free ascent but didn't want to be up on this giant lightning rod any longer than needed, so we continued up a few more pitches to link with the infamous Medieval Alleyway at the top of Homage to the Spider. Topping out on the summit was like visiting with an old friend. I'd been up there almost a dozen times and still hadn't tired of taking a wild ride up that mountain. The climbing had been tough, but the name of the route came easy: Bucking Horse Rider.